Student politics is back into play in our state. 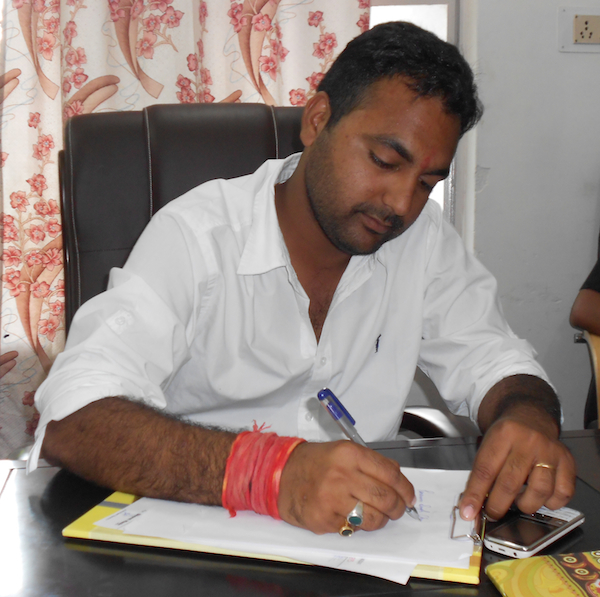 And after a month of severely heated atmosphere in the game of this very powerful fundamental step of our national politics, Paramveer Singh Chundawat of Chatra Sangharsh Samiti emerged out to be the winner of the elections in the second largest University of Rajasthan – The Mohan Lal Sukhadia University covering more than 180 colleges in 7 districts of the state. Q. Everyone knows Paramveer Singh Chundawat as the President of MLSU, will you tell us some more details about you? Your family and educational background! A. Well… I had held the 7th merit in my B.Com from UCCMS, then completed my MBA from the Faculty of Management Studies, Udaipur. I’ve also worked as an Assistant Professor in Sabar College, Gandhinagar for a year. While right now, I’m pursuing my management Ph.D from the same university and yeah my schooling went from St. Paul’s. Talking about family… My father, Mr. D.S. Chundawat is currently the Dean of the University College of Commerce & Management Studies (UCCMS), mother is a housewife; have an elder sister who is a Doctor and a younger brother half the way through his engineering. Q. You have worked as an Assistant Professor, also are qualified well enough to work in management sector, then why did you chose entering politics and not any other field? A. It’s just that I wanted to work for the welfare of students; and thankfully I’ve got the best post I required to do it. Q. As the students’ highest representative now, what are you plans to accomplish this year? A. Presently I’m trying to fulfill all the promises that I made in my election manifesto. My major emphasis is on campus placements and a membership in the Board of Management (BOM). A healthcare center will also be opened in the campus for providing medical facilities to the students. Moreover, the old exam pattern has also been revised, paving way for more advancement & simpler qualifying. A. Actions were taken in that incident..! Moreover now the pattern will also be totally changed, (smiles) 😀 no peon can check an OMR unless he’s an optical reader. Q. After your tenure ends, what future are you seeing to frame yourself into? A. I’ll stay in politics. Q. And who is your role model? A. Wholly and solely, Mr. Rahul Gandhi! Q. What role do you justify of your family and the former president, Mr. Dilip Joshi in your reaching to this reputable post? Q. Who are your other team members in the Central Student Union? A. Nobody has joined yet, everybody was busy..! They’ll be soon in their office. Q. Do you want to give any guidelines to the young students who are keen to join politics? A. There’s just one rule- “Work for student welfare.” Help them heartily & that will make your way. Q. Recently there was the famous movement of Anna Hazare, which was supported by the youth in almost each & every part of the country. In future, if any such problem arises; will you lead the students of this University as a part of the rebel; irrespective of the party it is against! A. I won’t say that I’m against any party but yeah I oppose corruption and will support every movement against it. We ourselves are big fans of Anna Hazare and if things went well, Udaipur will be lucky enough to see him on our land soon. Q. These days, the issue of not following constitutional reservation in the recruitment of Professors in MLSU is also in high light! What do you say about it? A. That’s the reason; we are trying for membership in the BOM! By the law, student representatives aren’t allowed to interfere in these matters. I; at my post can’t do anything right now but hopefully to my knowledge, proper rules…! will be followed in the recruitments. Q. Any message you want to give to the students through UdaipurBlog.com? A. I’m extremely thankful to you all for selecting me for this post. You are my power… You all are my ultimate fuel! Thanks a lot. i encourage the winner. student politics is very important in our society because it paves way for real time efficient politics.